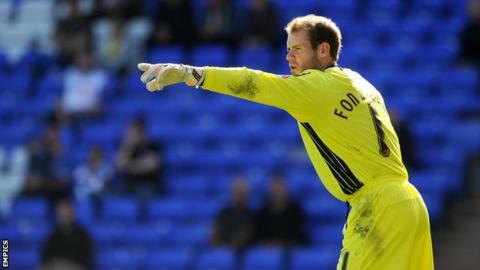 Tranmere goalkeeper Owain Fon Williams has been backed to recover from the mistake that contributed to Rovers' 2-0 defeat by Wolverhampton Wanderers. A tame effort from Leigh Griffiths squirmed past Fon Williams, gifting Wolves an early lead at Molineux. "It's disappointing and he's got his head in his hands, but he kept us in the game on Saturday at Coventry. "It happens. That's football. He's just got to get on with it," boss Ronnie Moore told BBC Radio Merseyside. Wales international Dave Edwards doubled the lead with a header just before half-time to seal a win that sent Wolves back to the top of League One. And Moore conceded that the hosts could have won by more goals as Tranmere were brought back to earth after their at the weekend. He wants to add to his squad before Thursday's loan deadline, with the centre of defence an area he is particularly keen to strengthen after revealing veteran Ian Goodison played on Tuesday despite suffering with a groin injury. "Where are you going to get an experienced centre-back?" said Moore. "No one's going to let them go, so it's going to be a kid again and you're taking a chance, but we need something so fingers crossed we manage to get somebody in."